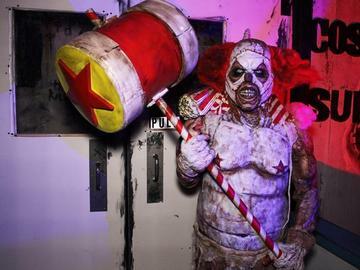 The SF Bay Area's famous haunted house event returns with 2 new, ridiculous haunted houses. It's time to SCREAM. You will experience intense audio, lighting, extreme low visibility, strobe lights, fog, special effects, and overall physically demanding environments. You should NOT enter these haunted houses if you suffer from asthma, heart conditions, physical ailments, respiratory or any type of medical problem, claustrophobia, any mental illness, are prone to seizure, or are pregnant. By entering the haunted houses at Fear Overload Scream Park, you acknowledge that the attractions may be inherently dangerous and that they are extremely dark. Enter at your own risk. You must be extremely vigilant. By entering, you voluntarily assume the risk of personal injury or death. Do not smoke, run, eat, drink, touch the actors, customers, or props. Take off all jewelry before entering. High-heels are not permitted. You must wear close-toed shoes at all times. We do not permit the use of video or flash photography inside the haunted houses. Fear Overload Scream Park may take and use images & video of all guests. Fear Overload Scream Park at all times reserves the right to videotape patrons, and take still images, and to utilize those images and videos for any reason, including marketing, advertising, promotion, on social media, and live streaming on the Internet. All property ownership of such materials, and copyright in and to all such materials, shall belong exclusively to Fear Overload Scream Park in perpetuity, without any compensation or other consideration to any guest or other person in, on or around the Fear Overload Scream Park property, including the inside of the Bayfair Mall and at the Bayfair Center in San Leandro, California.